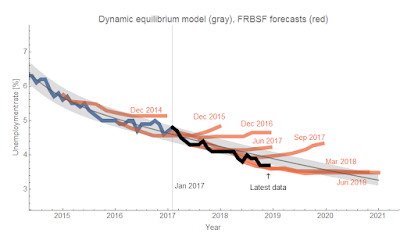 Funny enough (again, dark humor) the unconstrained fit now matches up with "median shock amplitude" fit (the two middle dashed blue curves are basically on top of each other). The truth is that fitting the leading edge of the data to a logistic function (and then taking the exponential) is not terribly stable, so expect many many revisions  to that counterfactual until we are about 1/2 the way through the shock. Part of the reason for this model is to lend credence to the idea that inflation is about the size of the labor force. We should expect 1.7% core PCE inflation (or 2.5% CPI inflation, all items) unless there are dramatic shifts in the size of the labor force like women entering the workforce in the 70s or men and women leaving the labor force in the aftermath of the Great Recession. The latter is the reason for that slight deviation in 2014 and the "lowflation" which has largely dissipated. Note that the relative sizes of the effects (surging or flagging inflation) agree with the relative size of the causes (labor force changes). But also looking at the longer run, most of these dips are just that — dips associated with a recession. There are only two major collapses that warrant adding a shock to the model (dot-com bust and 2008). 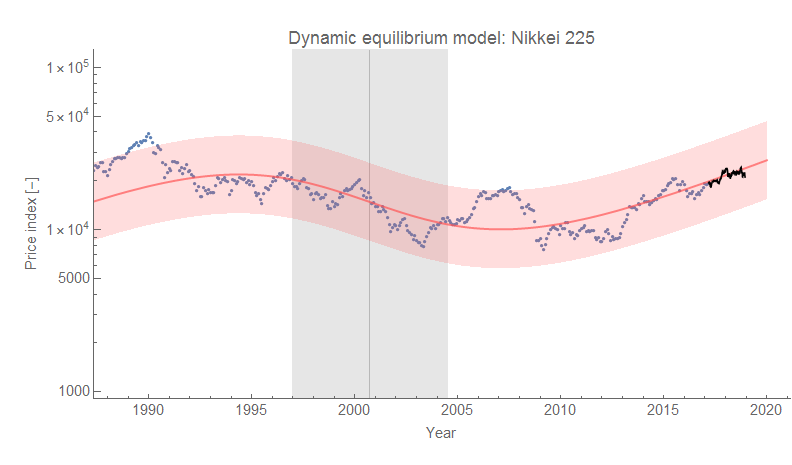 Of course, it's possible to model the longer negative shock in the 70s as a series of smaller shocks, but none are close to the scale of 2001 and 2008. Given most of the history of the market, we should expect the current dip — should it extend significantly below the confidence limit — to be just that: a dip likely associated with a recession or at least (seemingly unnecessary) Fed rate hikes. However, given the recent history of the market, we might expect a larger collapse as part of what I've called the "asset bubble era". This period, roughly since the 90s, is period after the demographic shock of the 60s and 70s has faded, inflation has subsided, and e.g. labor force participation ceased rising rapidly. Two of the paths constrain the amplitude of the shock to be the median (absolute value) amplitude of all the previous shocks. One of those leaves the shock duration and timing to be fit to data, the other just leaves the duration. The timing was constrained to be the value indicated by the timing estimated from yield curve inversion. The third (and smallest) fits all three parameters. 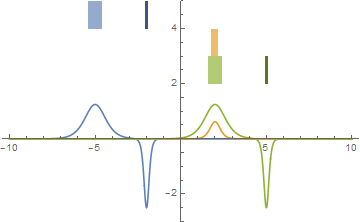 This is probably showing the undershooting and overshooting that is a drawback of fitting logistic functions to partial shocks. 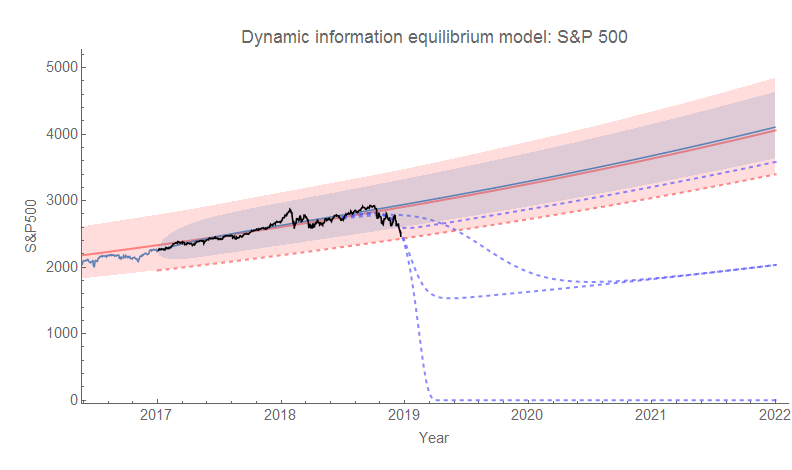 I also included my joke path ("lol capitalizm iz doomd") I showed on Twitter the other day where the S&P 500 collapses to zero. I'd say that is unlikely (it is, however, the result of doing the fit with just a fixed shock timing). 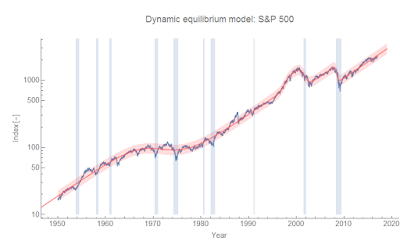 Have we entered a new era since the 1990s where recessions coincide with major collapses in the stock market? Or will we return to the era before the 1990s where markets fall during recessions, but rebound quickly? My hunch is the former and I'm not looking forward to the economy in 2019. We're coming up on the end of 2018. I'd first like to say thank you to everyone who has been reading and sharing the blog posts and the tweets. I've slowed down a bit — only 169 posts in 2018 up until today, well below the peak of 375 in 2015. And many of those posts were just checking the validity of the forecasts with each data release! In part, that's due to the fact that a project I was working on where I had to travel once a month to the middle of nowhere for one to two weeks ended in 2016. I don't have as many evenings sitting in a hotel room with nothing to do besides research and writing these days. Only one post from this year cracked the top 10 of all time on this blog — it was my critique of macro written from the perspective of having seen both the 10 years of econ criticism since the Great Recession alongside 10 years of defenses. I titled it Macro criticism, but not that kind in reference to the torrent of "lazy econ critiques" as well as Noah Smith's Bloomberg article (Econ Critics Are Stuck in the Past) written a few weeks before. 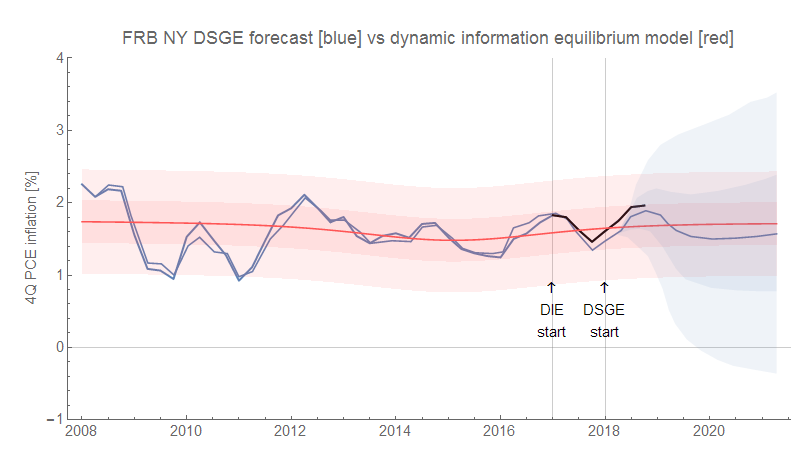 I also think it's relevant that my critique of macro comes alongside empirically accurate forecasts of e.g. 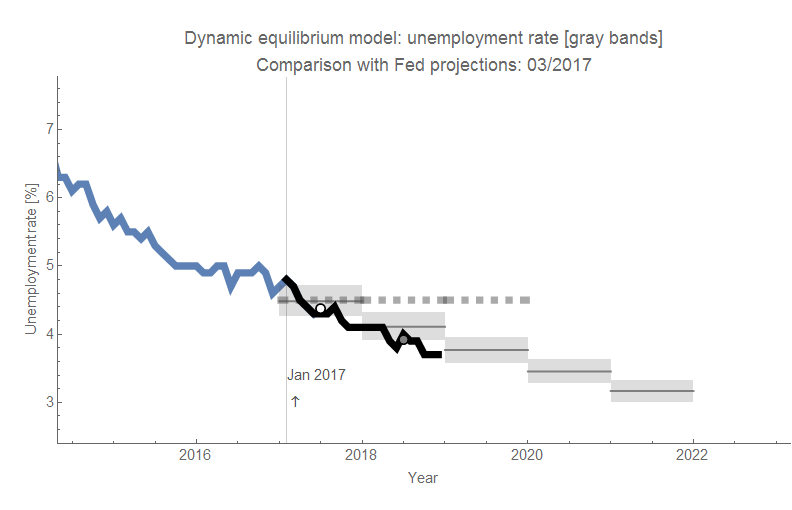 the unemployment rate compared to Fed macroeconomists (FRBSF, FOMC) — at least it's not lazy. This year kicked off with me posting the dynamic information equilibrium paper to SSRN. 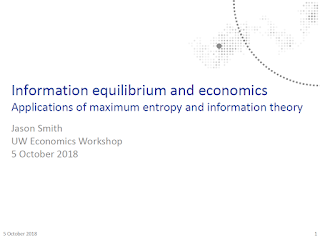 It also included the application to ensembles of information equilibrium relationships (markets) — i.e. "macro". While I had been working on it since the summer of 2017, a message from Fabio Ghironi at the UW econ department prompted me to finish it over the holiday break. That eventually lead to my participation in the "Outside the Box" economics workshop Fabio organized in October. Another unexpected message came from one of my blogging heroes — Cosma Shalizi. Blogging is really about writing that wouldn't find a place in any traditional outlet. Although he's not blogging as much these days, he wrote one of the greatest examples of the form with a perfect title (hilarious enough on its own, although the reference now may be lost on the younger generations). A book review that ties together computational complexity and economics, I link to it any time I can find a way to work it in. Cosma wrote me to let me know he was reading my book (!) and that he'd had the same interpretation of Gary Becker's paper written up in a draft blog post. I told him he should post it — it does a great job of addressing the supply side (which I sort of skipped over). He did, and I tweeted about it. 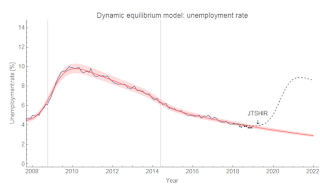 I should also add that I owe a debt of gratitude to another great blogger, economist David Glasner, for pointing the paper out to me a few years ago. 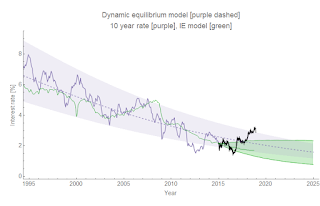 This year prompted me to rethink the interest rate model that was actually one of the first decent models I put together with the information equilibrium framework. 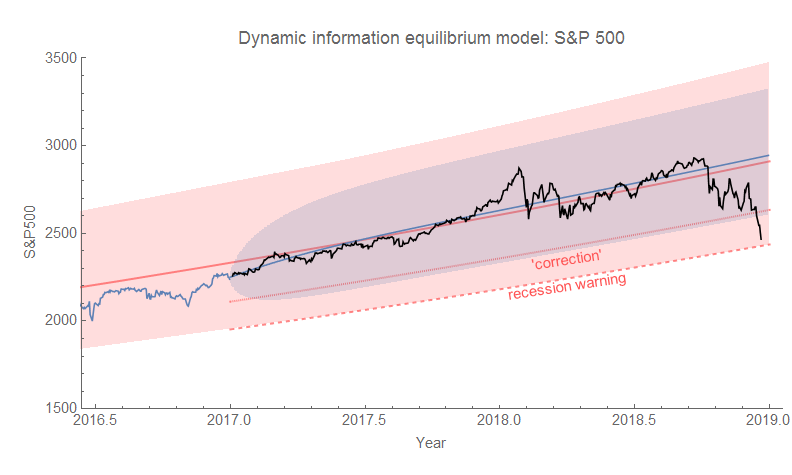 The large deviation that began with the 2016 election is well outside the normal range of errors — but such deviations have been signs of recessions (and model error is generally worse close to yield curve inversions). 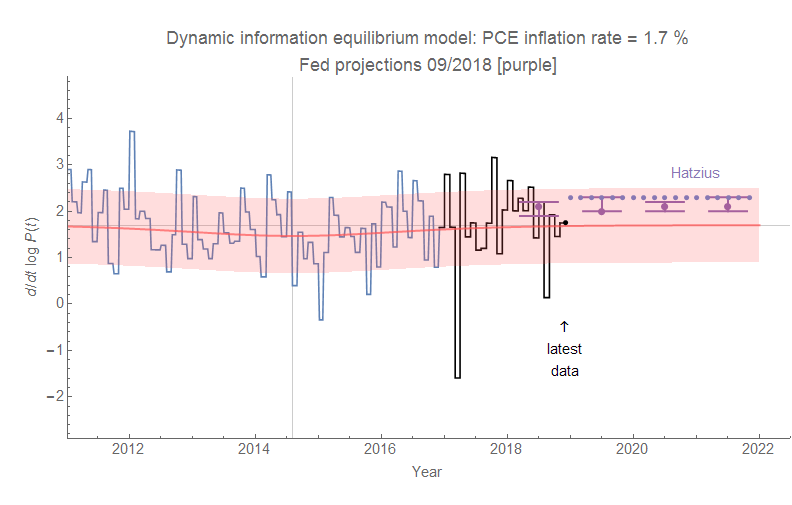 Recently, interest rates have been coming back down and a future recession could bring the model right back in alignment with data (i.e. we might have just underestimated the errors). 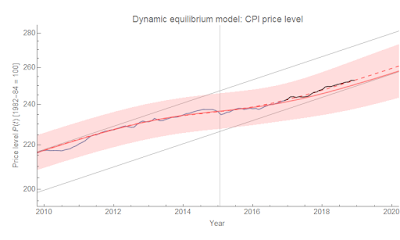 As it is, it seems the dynamic equilibrium model where the interest rate is a price is accurate, but the supply and demand related to it are only approximated by the monetary base (minus reserves) and aggregate demand measured by NGDP. 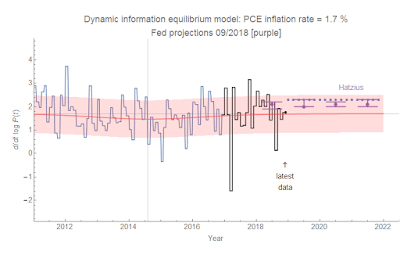 A recession in late 2019? 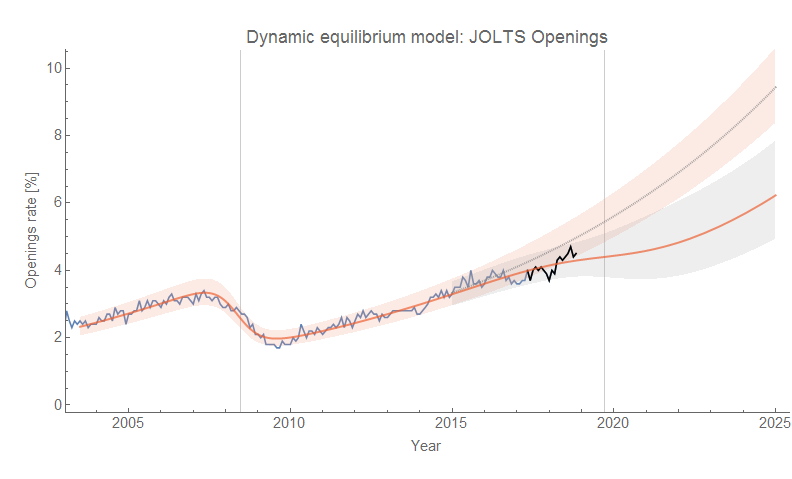 I put my neck out and said that the negative deviation in the JOLTS openings data was the first signs of an upcoming recession (i.e. a slowing in businesses expanding). 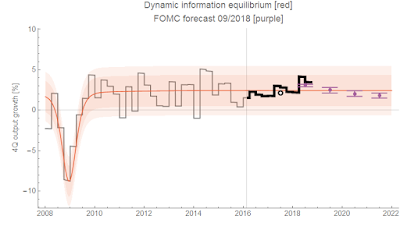 The shocks to the JOLTS data series appear to lead the rise unemployment rate by almost a year, and with the yield curve heading for inversion on roughly the same time scale I'm around 80% confident in this forecast. There's also wage growth rising to levels comparable with NGDP growth, which seems to be associated with the past few recessions. At the very least, I hope to learn something! 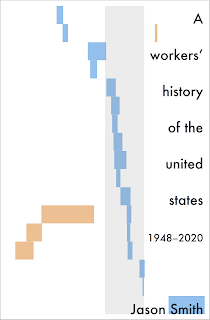 At the end of this year, I set myself a deadline for my second book — A Workers' History of the United States 1948-2020 — for the end of next year. Collecting the information together has actually led to some additional insights (e.g. 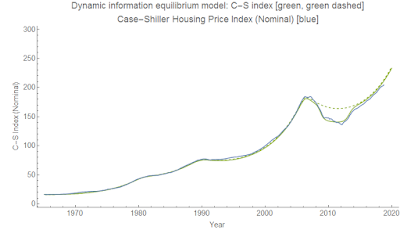 the effect of unions on inequality and the (lack of) a housing bubble). This has been another great year, and I'd like to thank everyone again for reading and sharing. Without you, this would likely just be a series of crackpot comments on other people's blogs (which is really not too far off the mark). If you're interested, here's a link to the year in review for 2017. Also, click to enlarge any images above. 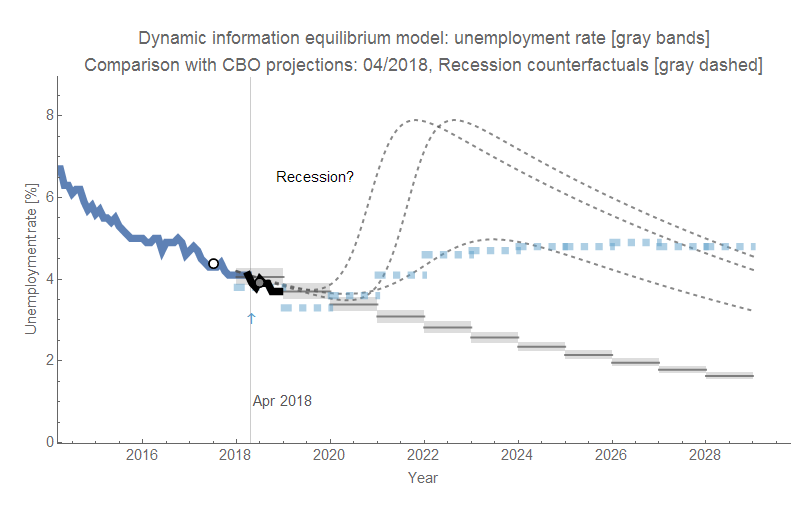 Here are the details about the re-estimate of the size of the post-2008 recession demographic shock (shown as the dashed line in the graphs). 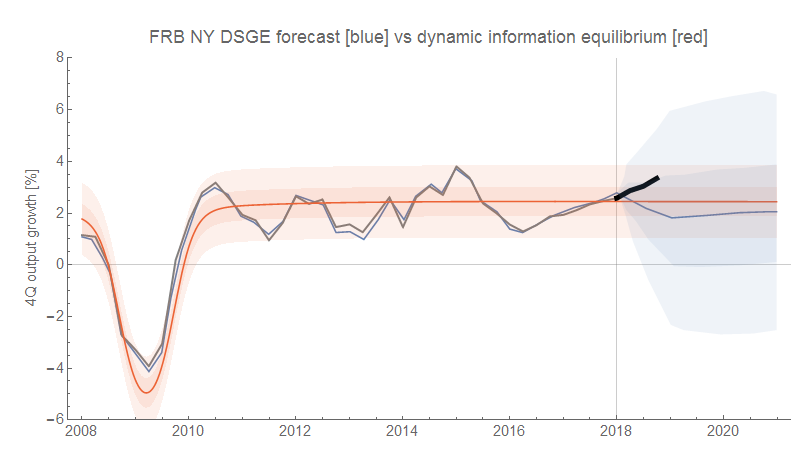 Checking in on the dynamic information equilibrium model forecasts, and everything is pretty much status quo. Job openings are still on a biased deviation. Click to enlarge. 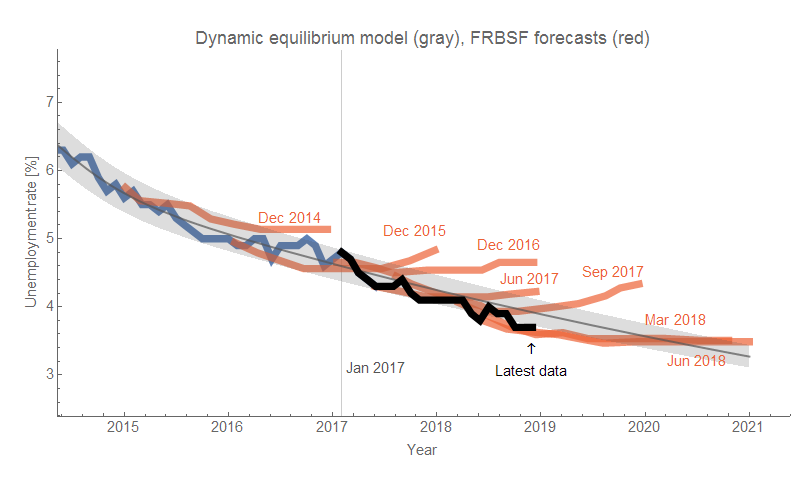 The dashed line shows a possible recession counterfactual (with average magnitude and width, i.e. 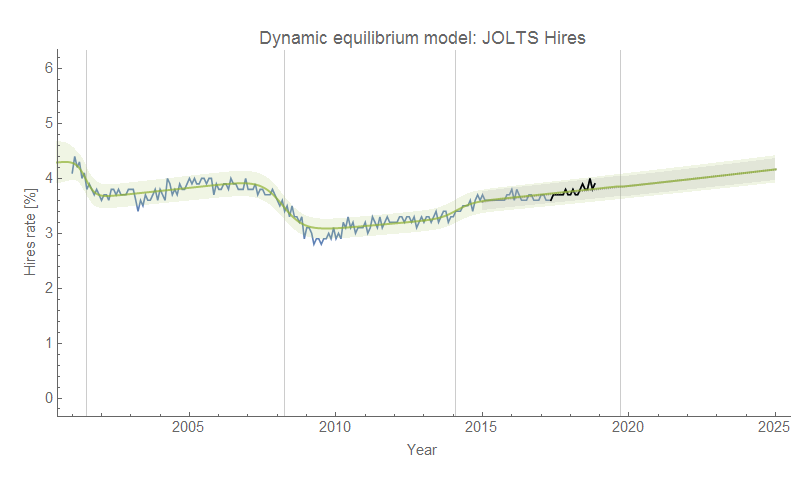 steepness) constrained by the fact that the JOLTS hires data is not showing any sign of a shock. Here's the previous update from November (with September 2018 JOLTS data). 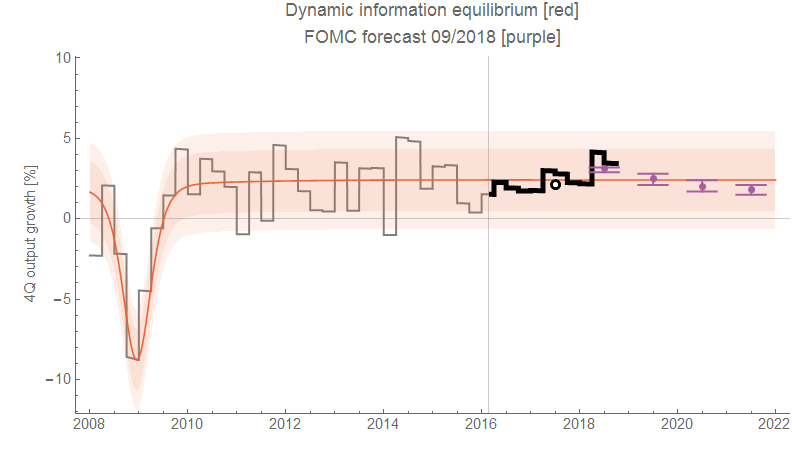 The FOMC forecast a 4.5% unemployment rate average for 2018. 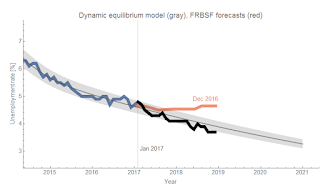 With almost all the data (which is why the average point is gray inside a black circle instead of white), it's looking closer to 3.9% — a 0.6 pp difference. 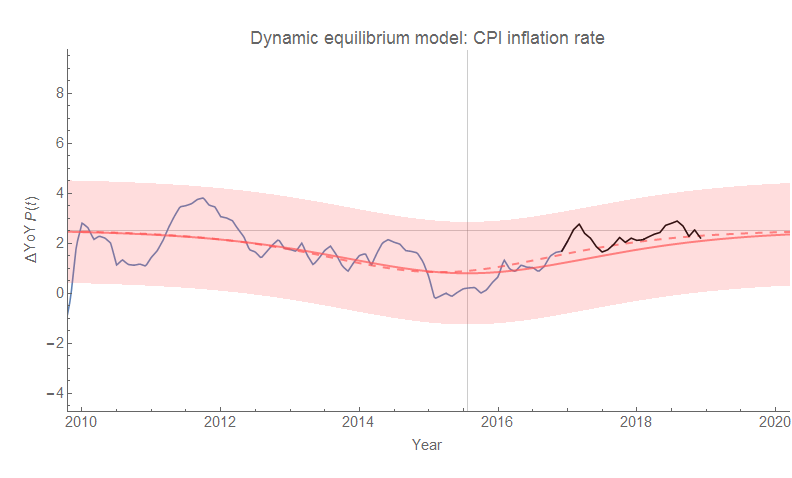 The DIEM annual average is 4.1% — a 0.2 pp difference (3 times smaller). As of writing this, the S&P 500 was down almost 2%. 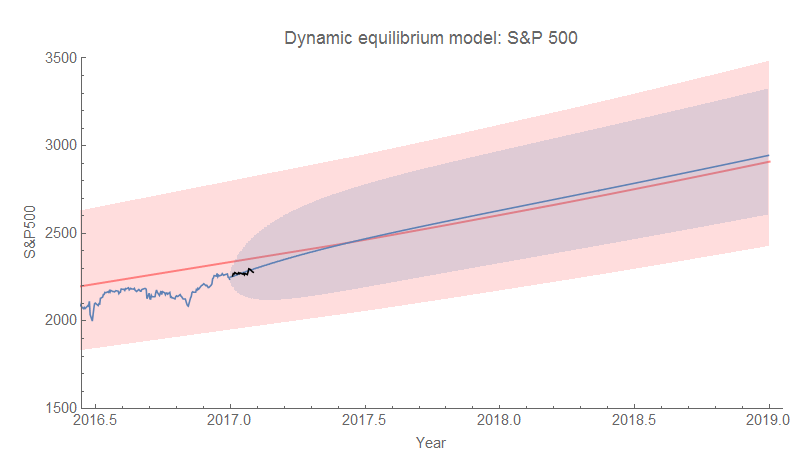 I thought I'd update the S&P 500 forecast (also from almost two years ago , and also pretty spot on) to show some more of the recent volatility. The last update was here. We're skirting the edge of the AR process band, but we're still inside the 60-year volatility band of the DIEM model, the lower edge of which (marked by a red dashed line) indicates the need to posit another shock to the DIEM. 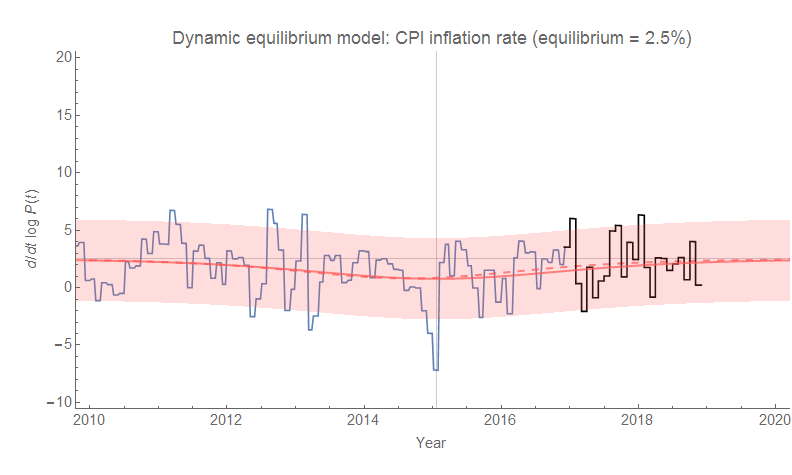 The median interest rate spread (which is about the same as the average or the principal component per the original model description) continues to trend downward. 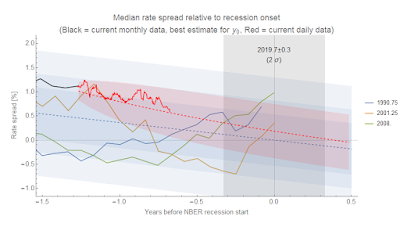 Note: this isn't a DIEM model, but rather a simple linear model of yield curve inversion as a leading indicator of recession. 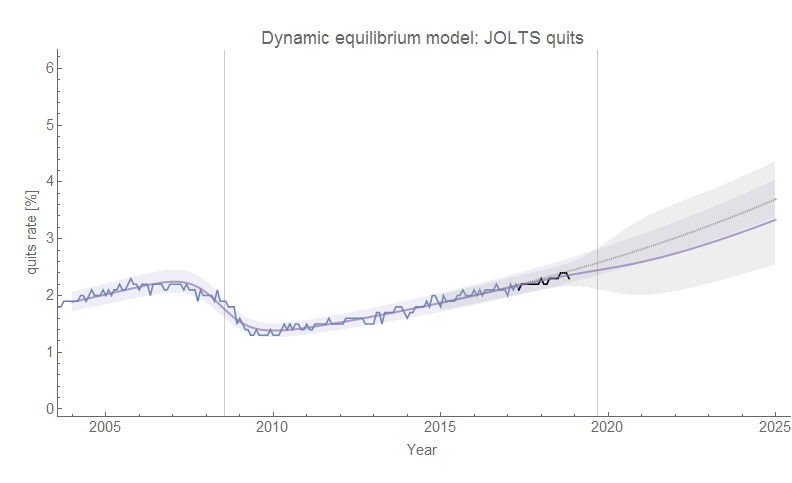 The model itself was born in a January 10, 2017 blog post when I derived it from an information equilibrium relationship for JOLTS data similar to a matching model. The dashed line shows a fit to the small fluctuations in the aftermath of the Great Recession (possible step response to the recession shock) that aren't that big in the growth rate, but create a noticeable effect in the level. In the aftermath of the S&L crisis of the late 80s, the growth rate for housing prices in equilibrium increases steadily — much like wages. 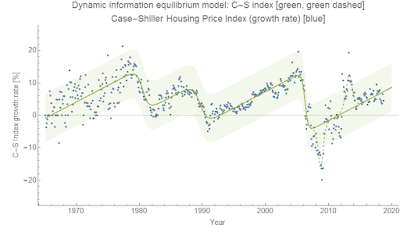 But there's no positive shock sending prices higher, no event between 1990 and 2006, just steady acceleration. Sure, the growth rate becomes insane at the end of that trajectory (> 10%), but that's the result of the equilibrium process. There's no "bubble" unless there's always a bubble. Did new ways of financing allow this acceleration to increase for a longer time? There's some evidence that wage growth is cut off by recessions (i.e. when wage growth reaches NGDP growth, it triggers a recession). 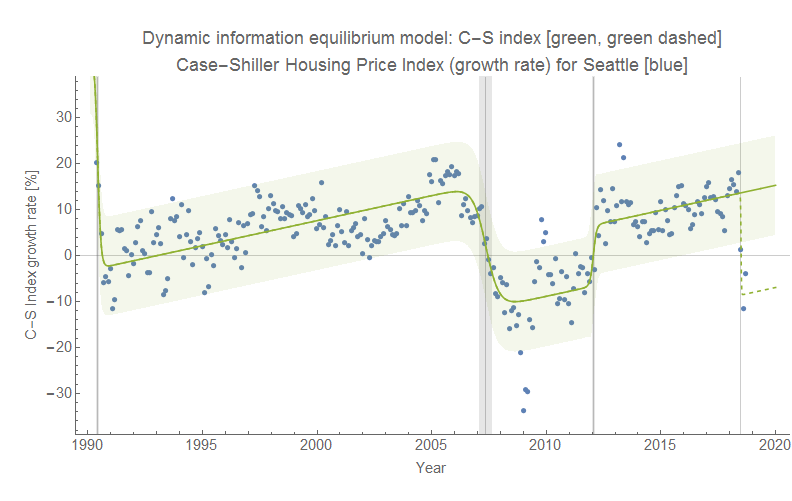 What is the corresponding housing price growth limit? 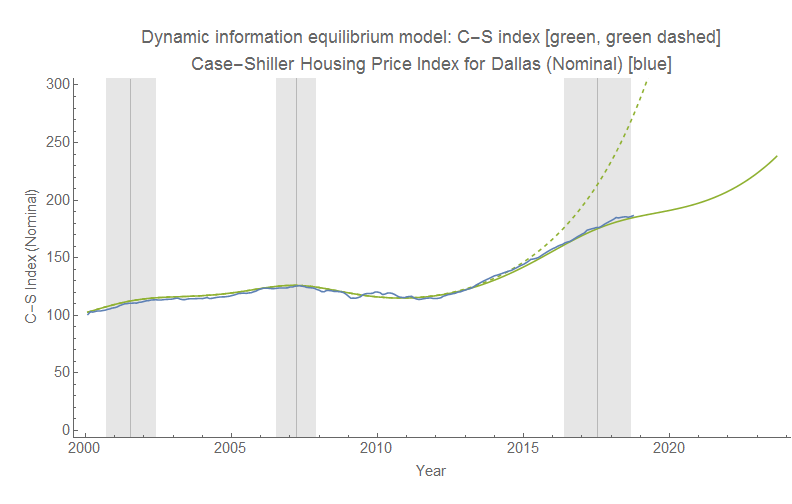 The pattern of debt growth roughly matches the housing price growth starting in the late 80s, but the shock to debt growth in the Great Recession comes well after the shock to housing prices. However, this improved interpretation of the housing price data puts the negative shock right when the immigration freak-out was happening and the shock to construction hires (not construction openings, but hires). This would raise a question as to why a shock to the supply of new housing would cause prices to fall. 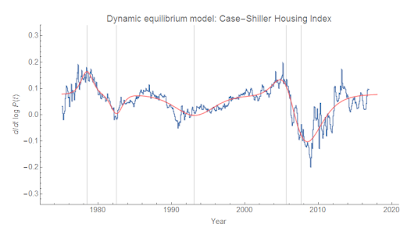 I've previously discussed how increasing the supply of housing should actually increase prices because it should be considered more as general equilibrium (supply doesn't increase much faster than demand). But also the dynamic information equilibrium model that produces this kind of accelerating growth rate is (d/dt) log CS ⇄ CS (just like the wage growth model). This has the interpretation that the demand for housing is related to the growth rate of housing prices (since the left side is demand). It's important to note that the shock to housing price growth rate comes before any decline in housing prices. The decline in growth rate would only have become noticeable in early 2006, but whatever the shock was that triggered it could have come as early as mid-2005 — which points to another possibility: hurricane Katrina. Or maybe simply housing prices themselves were the cause. Eventually, regardless of creative financing options, people become unable to afford prices that grow faster than income. It's not so much of a bubble, but supply and demand for a scarce resource. 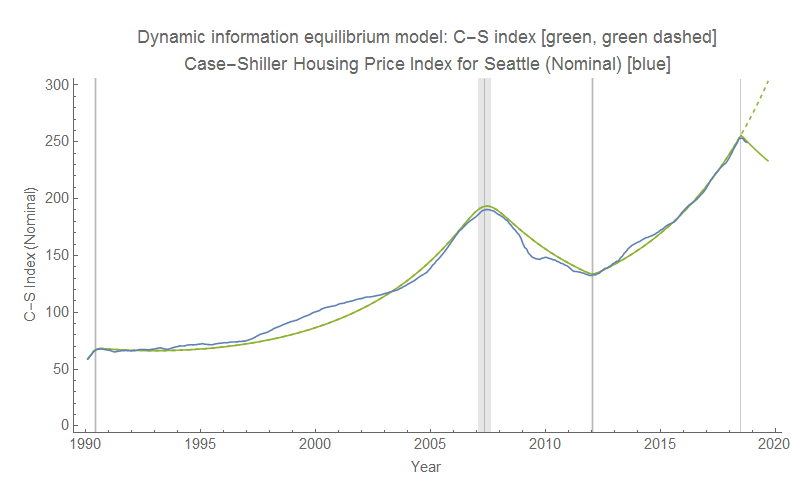 Maybe demand for housing really was that great. Judging by the increase in homelessness in the aftermath (e.g. Seattle), that is a plausible explanation. 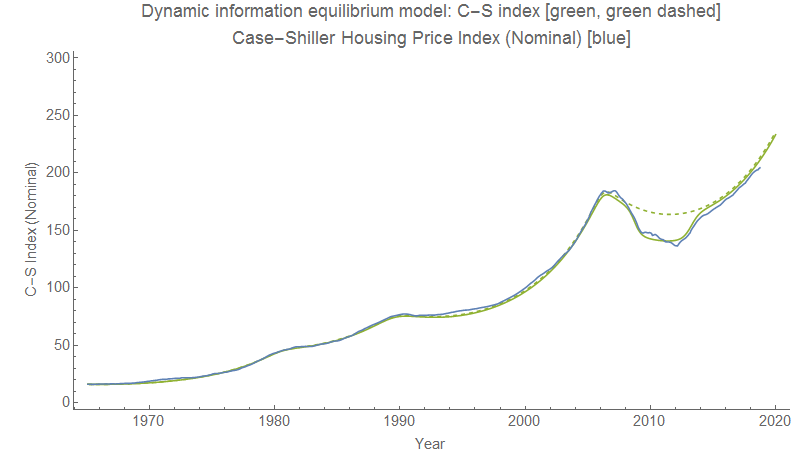 If it was truly a bubble, then there'd be a glut of housing, but prices seem to have continued on their previous path . See Kenneth Duda's comment below and my response for a bit more on possible causes, including the OTS decision to loosen requirements set by the CRA. 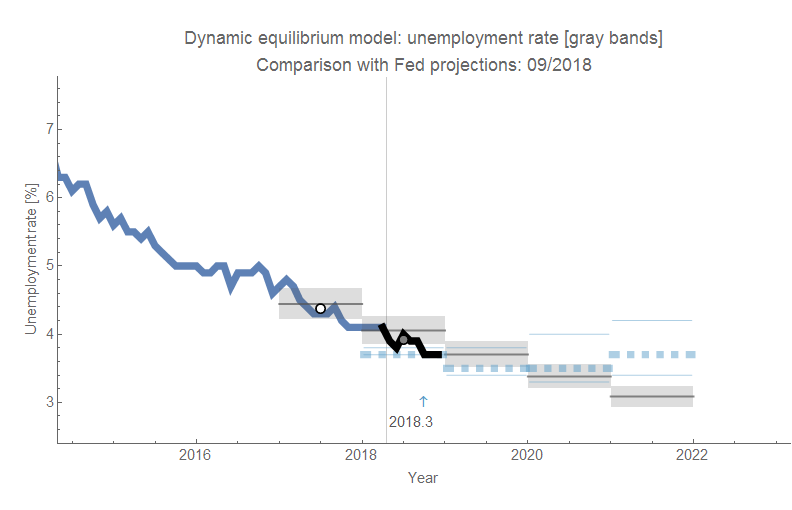 I would like to point out that the difference between the dashed green curve and the solid one in the CS-level diagram above could be interpreted as a result of mis-management by the Fed and the government in 2008. 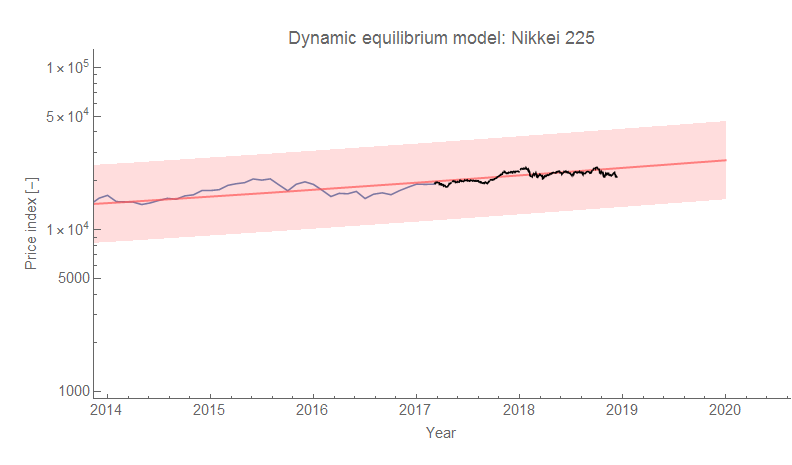 However, it could also be interpreted as a measure of the general level of panic and overreaction (the downturn appears to overshoot the price level path resulting in a deeper dive than indicated by later prices). As you can tell, the shocks are quite different. 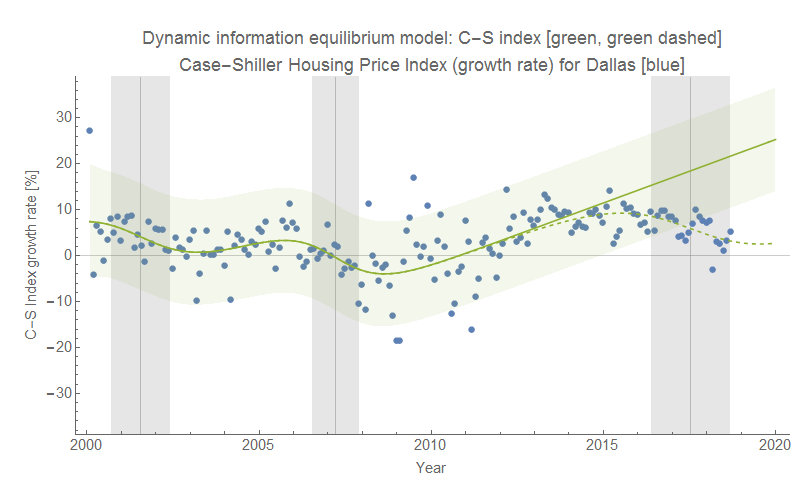 Dallas doesn't have much of a housing collapse, but seems to be undergoing a fairly large shock over the past couple years. Do note that the time periods are different (since the 90s for Seattle, since 2000 for Dallas) because that was the data on FRED. You can also see the tail end of the drop in 1990 associated with the birth of grunge. It is possible this is part of the early signs of the hypothetical upcoming recession. 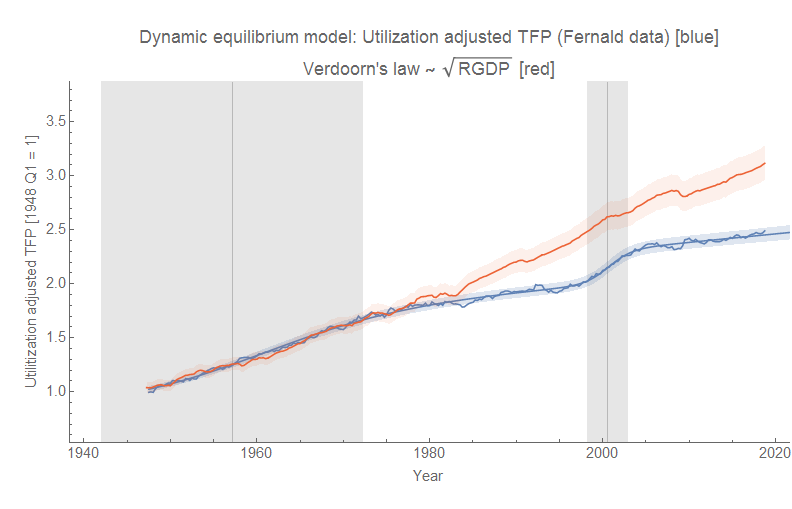 Productivity came up on Twitter yesterday, and I put together a quick dynamic information equilibrium model (DIEM) of the utilization-adjusted Total Factor Productivity (TFP) data curated by John Fernald at the FRBSF. First, let me note that I generally think of TFP as phlogiston. 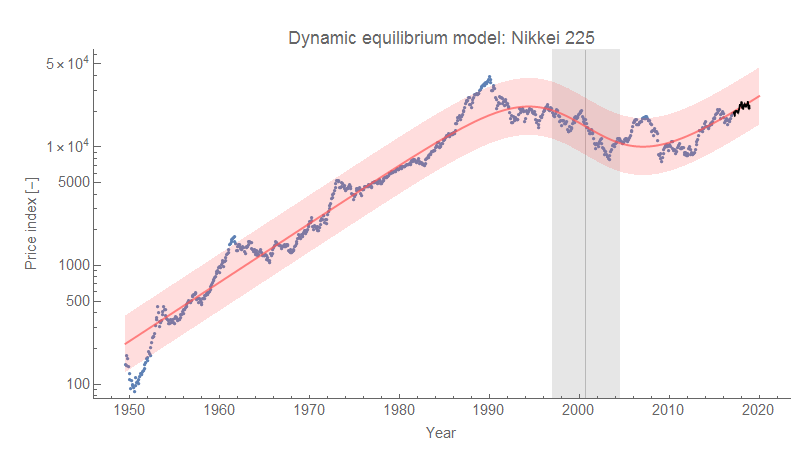 However, this case is a good example of potential ambiguity in finding the dynamic equilibrium. 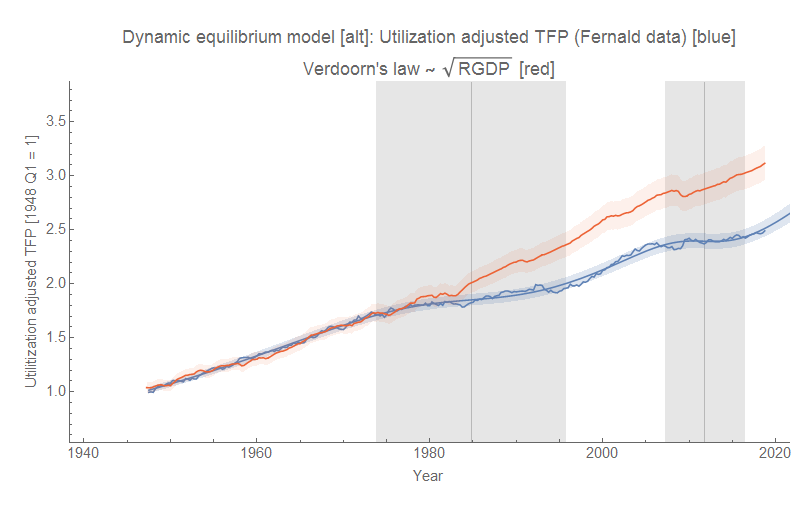 The TFP data is actually pretty well described by the DIEM, but its possible to effectively exchange the regions of the data that are "shocks" and the regions of the data that are "equilibrium". In this first graph, equilibrium is from the start of the data series until the 70s and 80s (a negative shock) and then in equilibrium again until the 2000s, followed by another negative shock after the Great Recession. 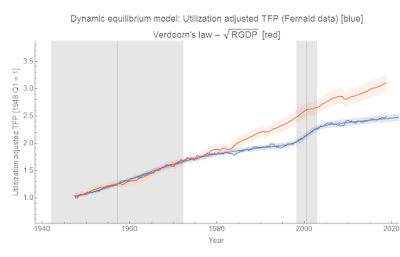 This data actually fits pretty well to Verdoorn's law that says (d/dt) log P ~ 0.5 (d/dt) log RGDP, and the shocks are deviations away from Verdoorn that just change the level. 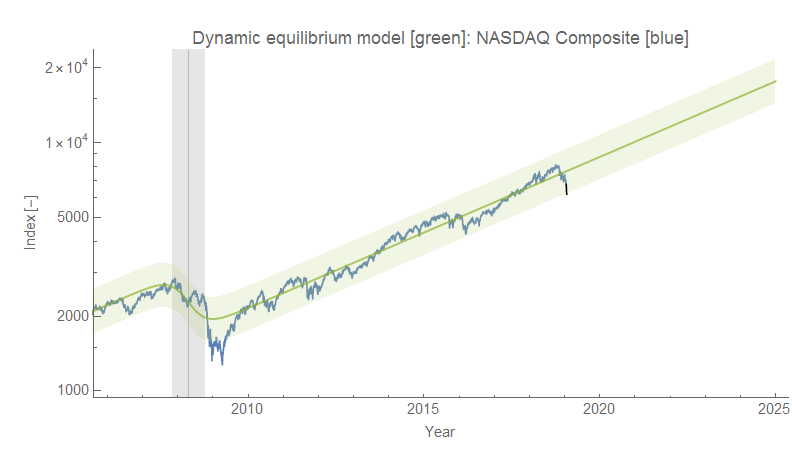 Additionally, this version has most of the data as equilibrium data (an underlying assumption of the DIEM approach). 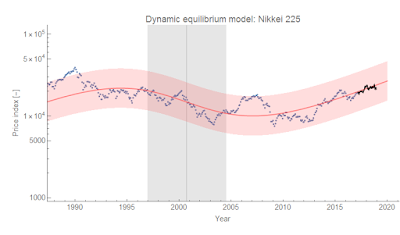 The fit is just slightly worse than this other fit (in terms of AIC, BIC, errors, etc) that sees the 80s and the present as equilibrium with positive shocks in the 50s & 60s as well as during the 2000s (i.e. 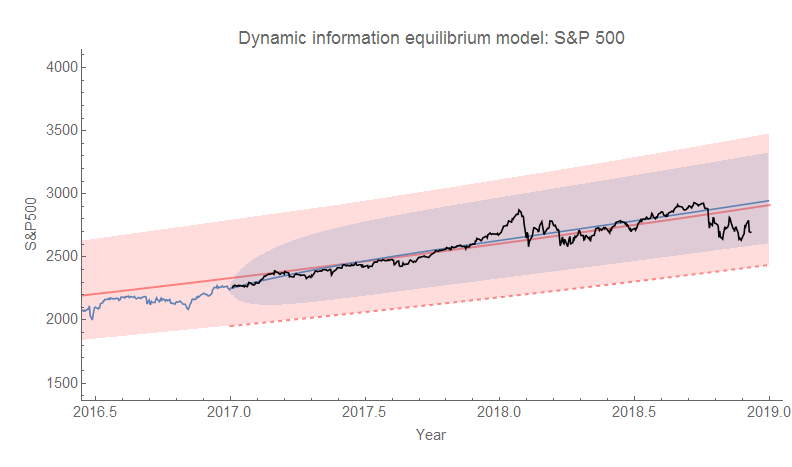 where the previous fit was "in equilibrium"). 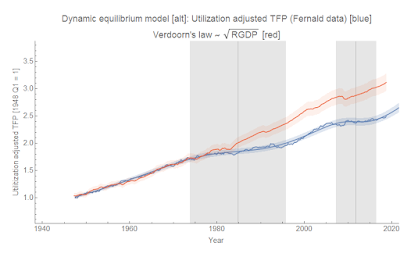 This version says Verdoorn's law was just a coincidence during the 1940s & 50s (when it was hypothesized). Of course, there are other reasons to prefer the second fit — e.g. 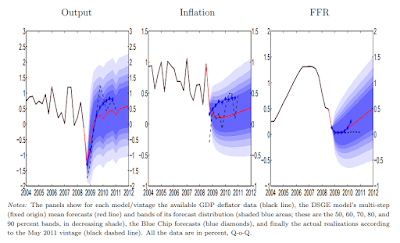 it matches better with the UK data, it has recognizable events (post-war growth, the financial bubbles). But the best way to show which one is right will be data. 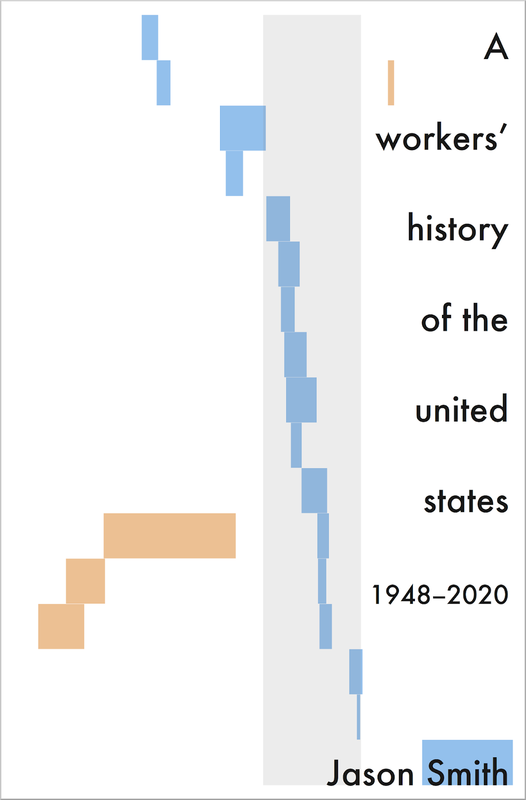 The first fit predicts a return to increased productivity growth soon. 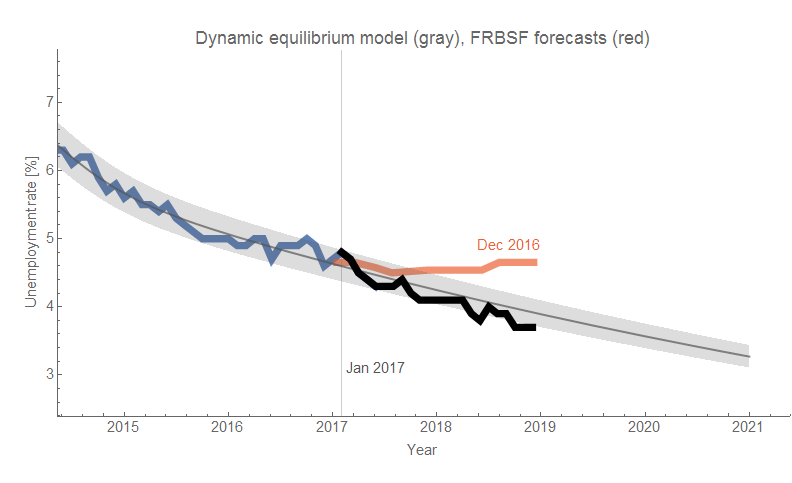 If higher growth doesn't return soon, it means each new data point requires re-estimating the fit parameters for events in the past — a sign your model is wrong. The second predicts continued productivity growth at the lower rate with any major deviations implying a new shock (not re-estimating parameters for old shocks). But still, the math on its own is ambiguous. The difference in AIC isn't enough to definitively select one mode over another. Circumstantial evidence can help, but what's really needed is more time for data to accrue. No lunch break today, so I'm late with these updates. The Q3 GDP numbers and related metrics are out. No surprises, but here are the various forecasts and head-to-heads I'm tracking. In my travels through the econoblogosphere and econ Twitter, I've come across mentions of Granger causality from time to time. I do not trust it as a method for determining causality between time series. 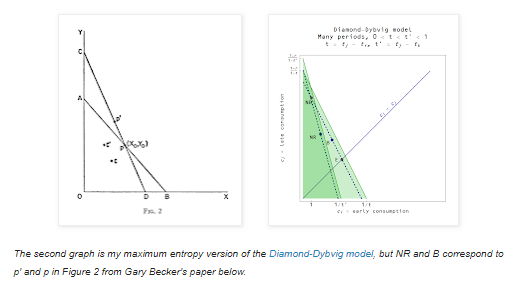 If you need to know what it is, the wikipedia article on it is terrible, and basically you should just refer to either Toda and Yamamoto (1995) or Dave Giles excellent description of what the process actually involves whenever you have co-integrated series which is pretty much all the time in macro. When the idea of cointegration was developed, over a decade later, it became clear immediately that if a pair of series was cointegrated then at least one of them must cause the other. Both of these ... time-series have a unit root, and are cointegrated ..., we know that there must be Granger causality in one direction or the other (or both) between these two variables. Since almost every macro time series is cointegrated, you can always find Granger causality one way or another (or both). Since almost every macro time series is cointegrated, you really have to work (basically follow the entire process Giles describes). There are lots of interim results that are needed to judge whether or not you can trust the results from determining cointegration to the number of lags to the results of the test in both directions. Even then, there are things that will pass Granger causality tests that represent logical fallacies or bend our notion of what we mean by causality. 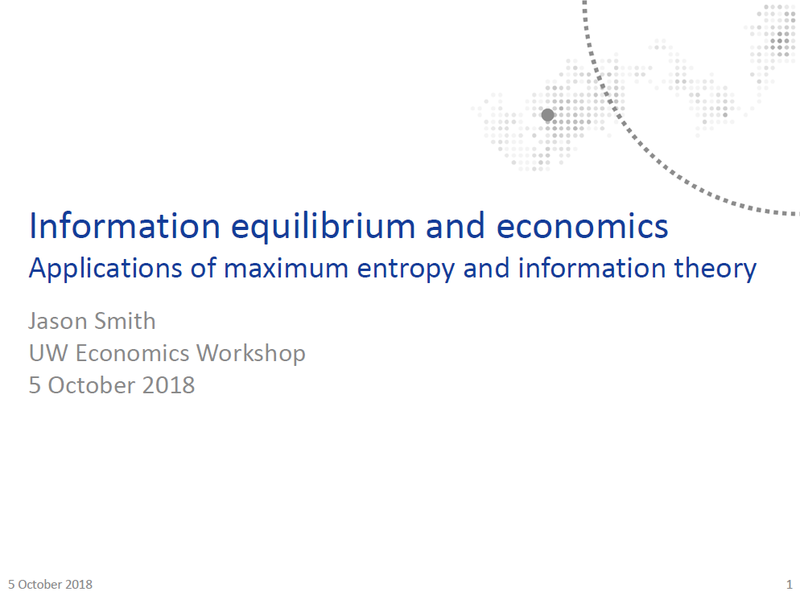 I give some examples, using the dynamic information equilibrium approach — which turns out to provide a much better metric for causality. Let's say we have two ideal cointegrated series where the noise is much much smaller than the measurement. The only thing adding noise does is make the p-values worse. 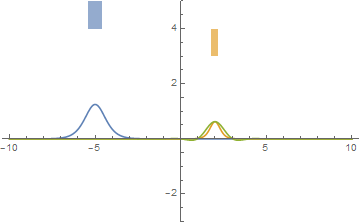 The way these two series are set up, only the first (blue) could potentially Granger-cause the second (yellow) because the second is effectively constant (after first differences or subtracting out the linear trend to remove the cointegration) for all times t < 0. 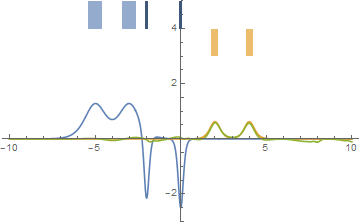 Therefore, by construction, we'd only have to test that yellow depends on a possible linear combination of its own lagged values and the lagged values of the blue series since blue cannot depend on lagged values of yellow (they're all approximately constants after first differences or zero after subtracting the linear trend). 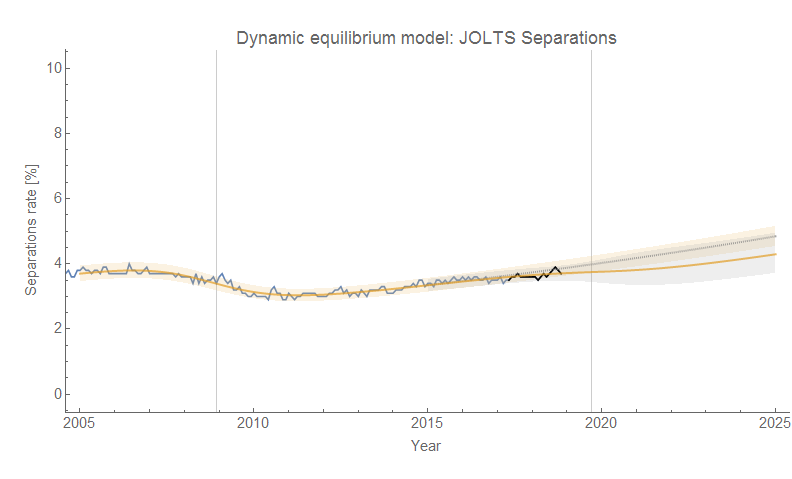 And depending on the temporal resolution, the yellow curve does not strongly depend on lagged values of itself. 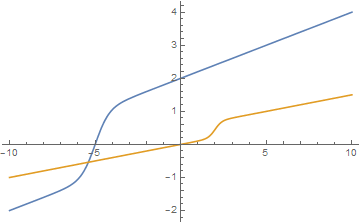 This sets up a scenario where Granger causality is effectively satisfied if we can represent the yellow curve in terms of lagged values of the blue curve. 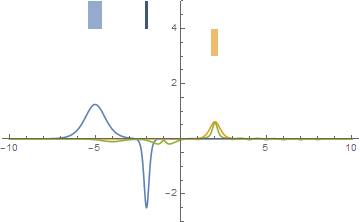 Here are the derivatives after subtracting the linear trend; the green curve is the blue curve shifted to the center of the yellow (it's still a bit wider). 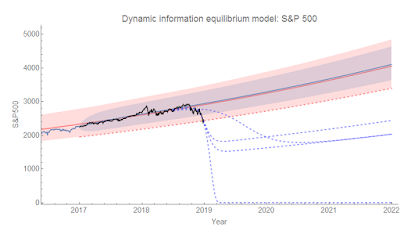 A representation in terms of an "economic seismogram" appears above the curves. 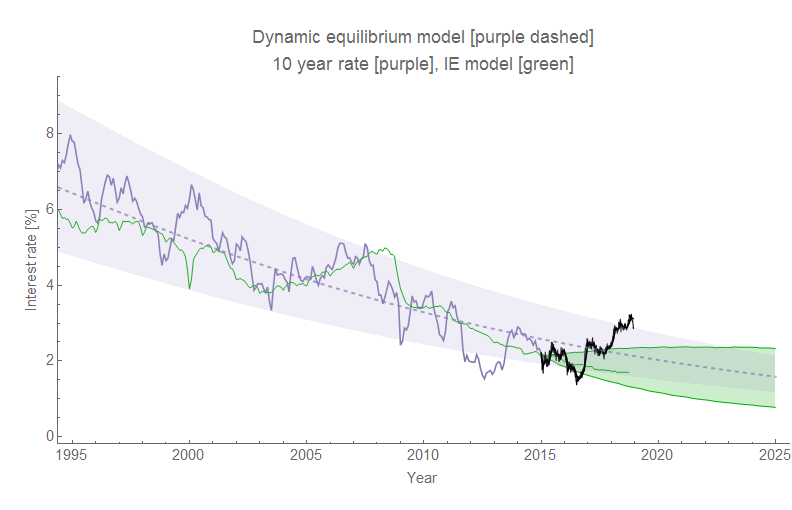 This is great, because it means that — except in extreme cases — an economic seismogram where shocks precede each other is sufficient to satisfy Granger causality. But this is also problematic for Granger causality for exactly the same reason I wouldn't use a single shock preceding another as the sole basis for causality because of the post hoc ergo propter hoc fallacy. Granger causality is effectively a test of whether changes in one series precede changes in another, and calling it "causality" is problematic for me. A better wording for a successful test in my opinion would be "Granger comes before" rather than "Granger causes". However, a failure of the test (i.e. the yellow curve does not 'Granger cause' the blue one) is a more robust causality result because it is based on physical causality — it is literally impossible for an event outside another event's past light cone to have caused that event. As Dave Giles puts it, it's a better test of Granger non-causality: affirming that the yellow curve did not cause the blue one more than affirming the blue one caused the yellow one. Again, I'd really just say that the blue shock "Granger comes before" the yellow ones (despite the green fit being almost perfect). Anyway, those are some of the reasons why I don't really trust Granger causality as a method especially when there are limited numbers of events (common in macro) — unless it's Granger non-causality, which is fine! 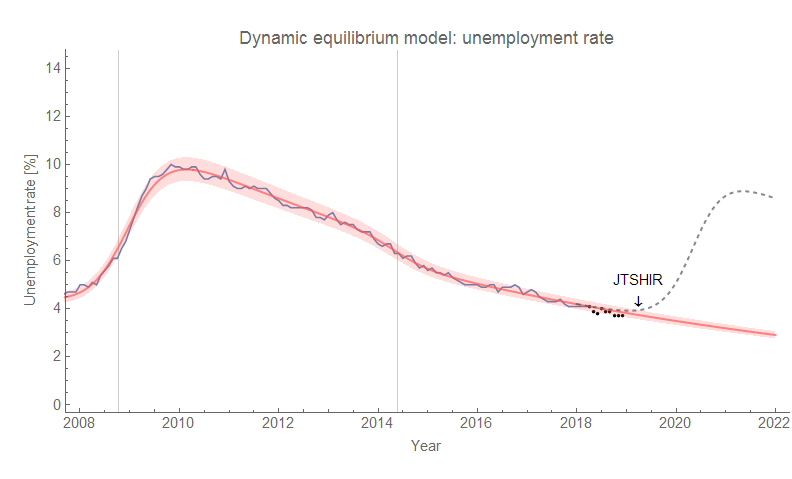 If I was up on my real analysis, I'd probably try to prove a theorem that says the economic seismograms satisfy Granger causality and under which conditions. 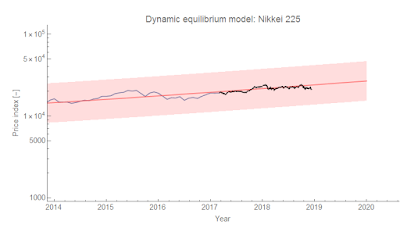 The temporal resolution needs to be high enough, noise needs to be low enough, and the earlier shocks need to be sufficiently narrow but I don't have specific relationships. The last one is actually temporal resolution dependent (i.e. 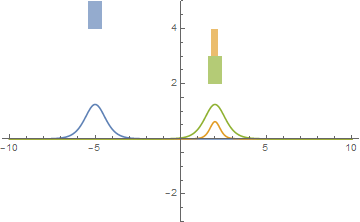 increasing the number of samples and the number of lags eventually allows a wide shock to Granger cause a narrow one). But I think a good take away here is that reasoning with these diagrams using multiple shocks is actually better than Granger causality.